Let’s try and improve your thought process at the time of trade identification and entry. Let’s start by looking at the higher timeframe structure. 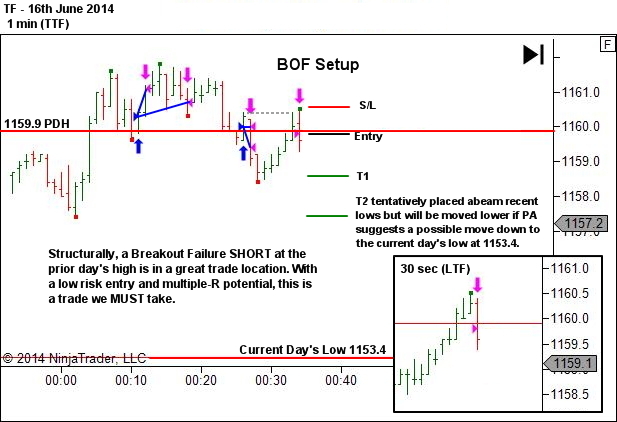 And now the trade entry on our Trading Timeframe chart. This is the wrong question! 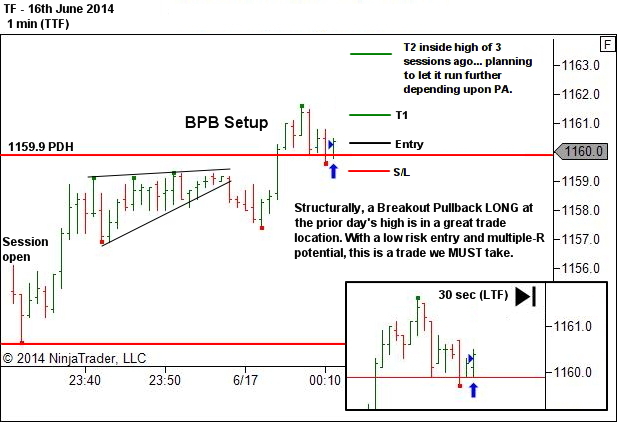 Structurally, a Breakout Pullback LONG at the prior day’s high is in a great trade location. 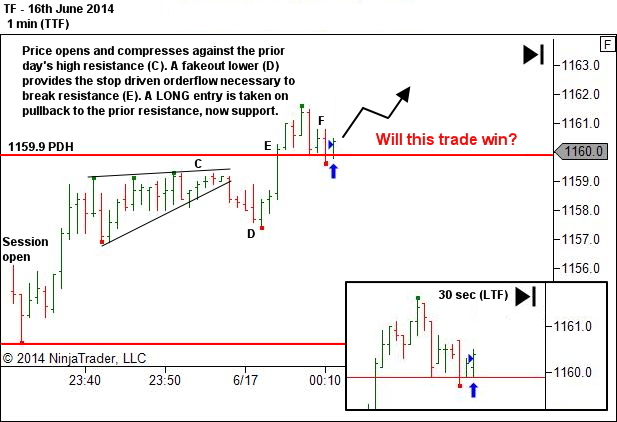 With a low risk entry and multiple-R potential, this is a trade we MUST take. It doesn’t matter if this particular trade wins or not. Your edge exists over a SERIES of trade. Some will lose. Some will win. The winners should overcome the losers. If it is… you are right to be in the trade. Now is the time to manage the risk and opportunity. And let your edge do its job over a series of trades. Again, structurally, we are trading in a good location. The market has fallen back below the prior day’s high and retested the level from below setting up a Breakout Failure SHORT. With a low risk entry and multiple-R potential, this is a trade we MUST take. It doesn’t matter if this particular trade wins or not. Your edge exists over a SERIES of trade. Some will lose. Some will win. The winners should overcome the losers. Will any particular trade win? You cannot know! But we don’t seek winners. We seek good reward:risk opportunities and manage whatever follows. Very useful article Lance, Thanks. 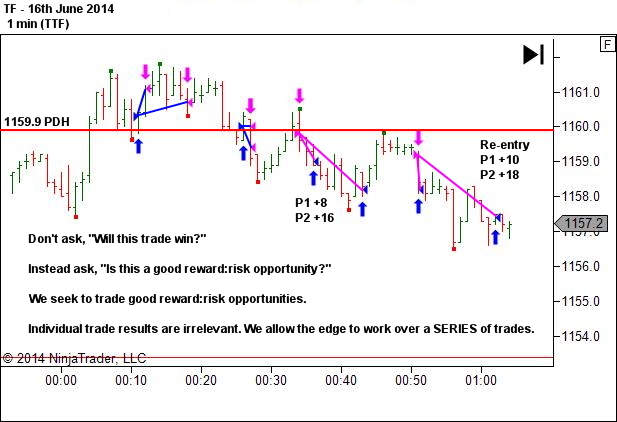 Learning has never stopped with your articles and especially this one was just a rehearsal of yesterdays trade to me. What does that mean? Could you explain more explicit, please? Study orderflow. Study auction market theory. Also look up “short squeeze” as it’s basically that same process, although most short squeeze info you’ll find will be talking about stocks on a daily timeframe. just bumped into this analysis, very educative. Just one question: your very first figure shows an downward trend, so why did you go long in your first two trades? Were they not against a HTF trend? Thanks for your great feedback. I’m glad you’re enjoying my writing. Much appreciated. I do not trade an HTF trend. 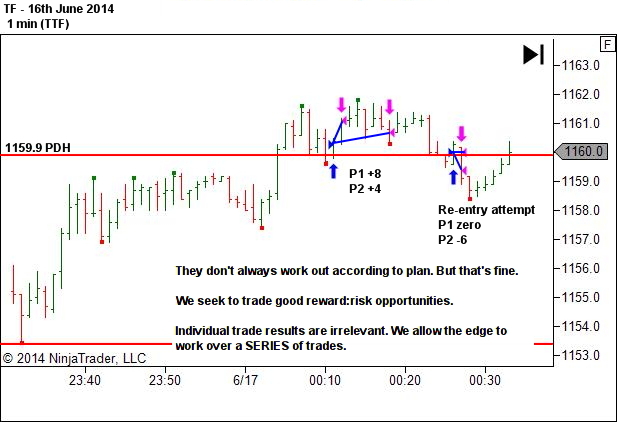 I trade the TTF trend within an HTF S/R framework. Essentially the HTF defines the potential barriers to the TTF trend. If one was to look at HTF trends it becomes a never-ending source of confusion. The trend you identified on the 30 min chart was down. But if you move out the the next higher timeframe, it’s an uptrend. So we have TTF up, HTF down, next higher HTF up. Which one is relevant? Or at least most significant? So I don’t look for trends in alignment. I trade the TTF trend. The HTF only determines the S/R structure. Thanks, Lance, for the article and comments! 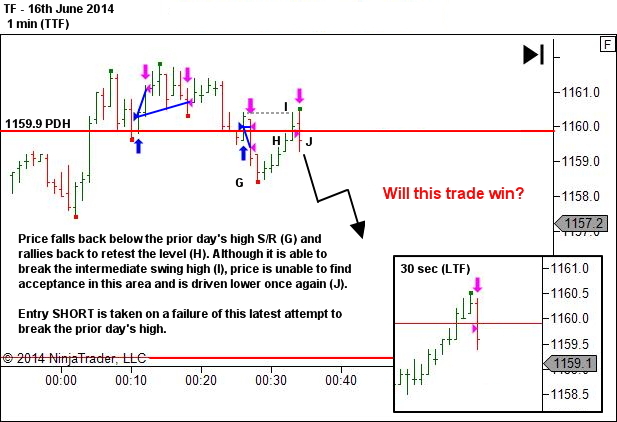 Have a look at the inset in the bottom right of that chart, showing the 30 second LTF. The same bearish moves show there, but with no follow through at all. Bearish move -> stall for 3 candles -> Bearish move going maybe only 1-2 ticks lower -> Stall again. Obviously the trade decision is made in real-time, so it benefits from information that we can’t see in the static historical charts. That is, the feeling and pace of movement. 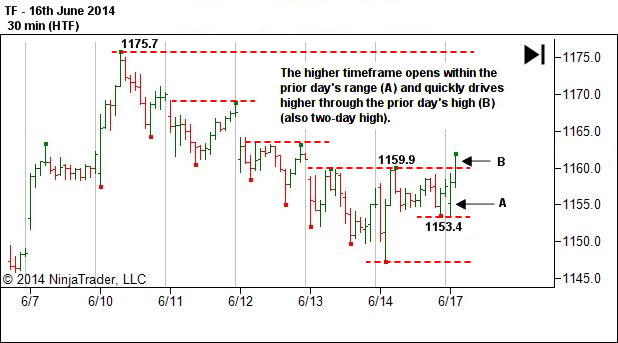 But we can often get a glimpse at that information through looking at different timeframes. The picture you’ve seen on the TTF is not present at all when taking a lower timeframe perspective.